Hi, I’m Rayna (pronounced similarly to China) and I am the new TID intern. 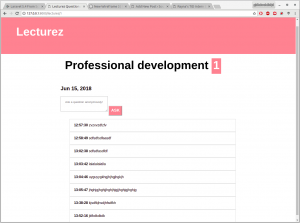 I just finished my 2nd year studying Computer Science and I am an aspiring web developer, as demonstrated on http://bit.do/raynaslinks – the best website in the world. Last summer and through the academic year I worked for the Quality & Test Team in iSolutions, so I’ve been here for a bit. My main project for these 12 weeks will be a system for anonymously asking questions in lectures. Other tasks of mine will include manually removing an obsolete link from thousands of records in Pure, as well as anything else my team wants me to do. My first task was to set up Linux alongside Windows on my work laptop (because I wanted Linux). It took a few hours of mainly waiting and unsuccessful attempts at making a bootable flash drive. In the end I had a healthy new Ubuntu and unaffected Windows. 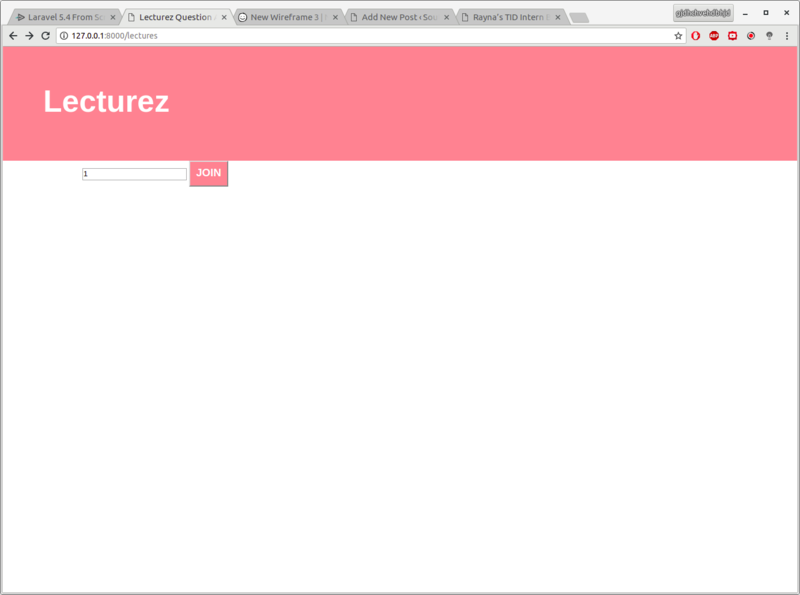 Then I had to set up Laravel, which was straightforward. I spent most of the week watching and following the official Laravel tutorials (Laracasts) to familiarise myself with Laravel. I developed some understanding of it and I was able to produce a stub of my intended project with very limited functionality. 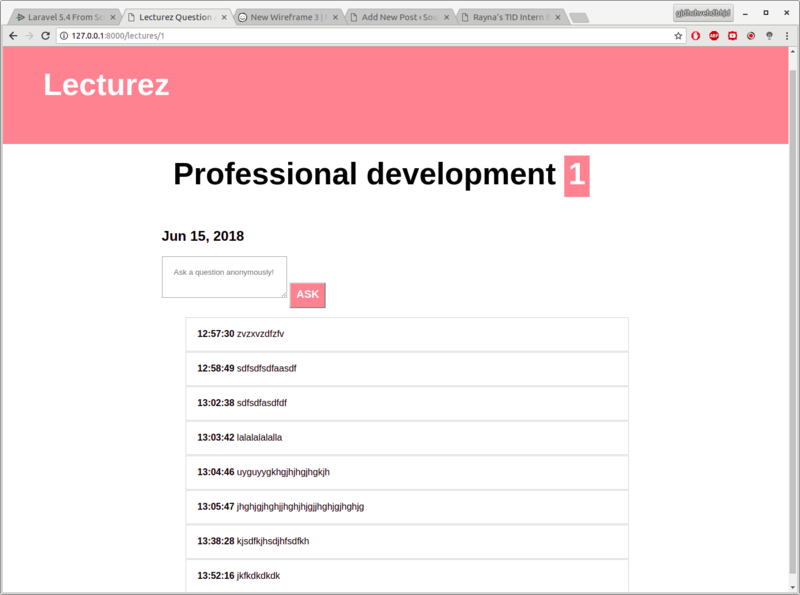 The screenshot below shows the initial screen, where you can type in the “lecture code” (the lecture’s number in the database) and it opens the lecture’s page. On this screen you can see the title of the lecture along with the lecture code, as well as all the questions asked so far. You can also add a question. There are no users and logins – the prototype is very simple. I also planned my requirements gathering process (described in the next section), contacted people to participate and prepared questions to ask them & wireframes to show them to spark a conversation. Next week the requirements gathering will begin. We’re putting together a focus group on Monday with students from different disciplines (excluding ECS). The focus group will aim to capture their current experience asking questions in lectures, their experience with any existing solutions for anonymous questions, and their expectations from an ideal system with that purpose. Later in the week another focus group will (probably) happen, where ECS students will be interviewed. The reason for the separation is that ECS students tend to have loud opinions on technology which may overshadow or contrast with the views of less tech-oriented students. Some students might be asked to participate in individual interviews later in the week also. The information gathered from students will be used as a basis for interviews with lecturers (assuming students will agree with the idea of the system). We will aim to interview lecturers from different disciplines (e.g. heath sciences + ECS + humanities) to capture a more broad set of experiences and requirements. Lecturers will also be shown wireframes and will be asked for any comments or criticisms. Another big task will be analysing the data from the focus groups and interviews and writing up formal requirements, as well as making wireframes of the design of the “final” system. A mistake I made when starting out with Laravel was passing objects to the templating system and calling methods on them inside the templates. It’s nifty when it works but if there’s a problem, debugging it is a nightmare.